There is a decent chance the audience watching the new Heathers TV show on the Paramount Network has never seen the original black comedy. This makes it equally possible that they will absolutely not understand the point of Heathers and the message. That message being that being popular, following trends and power can all easily be a bigger influence on people than being a moral person. The film dealt with serious issues in a way that highlighted how little, not only the main characters cared, but also how little the audience cared… and in turn how little society cares. Things only matter when it’s “cool” that they do. So, how does the new TV version of the show hold up? First of all, this time around, instead of thin, pretty, privileged white girls, the group is made up of mostly “marginalized” characters. It’s an attempt to point out the popularity of being a social-justice warrior and how much of that is simply a grab, not daring to go against the status quo. I have already seen the tweets and posts by those against the show for its take on the political nature, currently in pop culture. I have to agree with the creators here, though. Like it or not, it’s an absurd and yet realistic vision of what we have become. As far as the show, itself, the look has a cinematic quality that is surprising. The writing is at times cringeworthy, particularly when they use lines from the original movie, giving them the occasional twist for today’s audiences. The acting is hit or miss, with Grace Cox, who plays Veronica Sawyer, giving a less-than-stellar performance, but Nikki SooHoo as Betty, was a surprising standout. I found it fairly hard to believe that two of the Heathers would have ever been popular. It’s not that I take issue with a marginalized person being popular, particularly if they come from a family with money. It’s more that I think the show goes over the top to make sure we get they aren’t pretty, thin white women. I have to question, is the show trying to show us all our ugly underbelly or just trying to be different for the sake of being different? I have to say, I like the concept of the show. If you are offended by the concept, perhaps you should take a long, hard look at yourself and what you are so afraid of. It’s fairly obvious to me that many reviews I have read absolutely miss the point of this show. As always, when I review the first episode of a new series, it’s hard to say exactly where the show will go. I give it thumbs up for its brazen look at today’s youth but in all honestly, am I entertained? Will I come back for seconds? I’m not so sure. The show isn’t particularly funny and I just didn’t leave the first episode caring too much about what happens to any of the stars. They could all live or die and it wouldn’t make much difference to me. A TV show is slightly different than a movie. I need someone to root for, in order to come back week after week. That’s something this show is definitely missing. I give Heathers three stars for its current look at the political nature of pop culture, but took stars away for its lack of watch-ability. 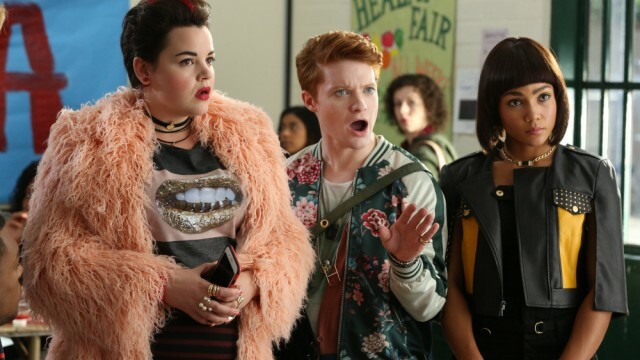 Heathers premiers March 7th at 9 pm central on the Paramount network. You can watch the first episode now, for free, on the Paramount Network website.